The chances of talks finding a way out of Nicaragua's deadly unrest have taken a blow after President Daniel Ortega used force to crush protests and called Catholic bishop mediators "coup-mongers," analysts said Friday. Ortega, a 72-year-old former guerrilla seen as increasingly autocratic, has taken a hardline stance in three months of street demonstrations demanding his departure. Police and paramilitaries have been deployed to fire upon student protesters and to seize a city south of the capital that had become a hotbed of opposition. On Thursday, Ortega slammed the bishops who have since May been mediating talks between him and the opposition, accusing them of backing armed "satanical terrorists" -- an extraordinary accusation in a poor Latin American country where Catholic reverence runs deep. His aim was clear, the opposition and analysts said: to discredit the bishops in a bid to ensure the talks reached an outcome he wanted, one that did not include early elections demanded by the protesters, the church and the Organization of American States. "Ortega disparaged the bishops to create his own dialogue, one he can control," said one opposition representative to the talks, Azahalea Solis. "What he is doing is disqualifying the bishops' mediation because he doesn't want to negotiate in a space where the subject of democratization has to be raised," a political analyst heading the Movement for Nicaragua group, Jose Antonio Peraza, told AFP. Four rounds of talks started May 16 have made little headway as both sides dug in. The last full session of negotiations was over a month ago. Since then, loyalist forces have stepped up their assaults on protesters. Last week, snipers and gunmen targeted university students who took shelter in a Managua church. This week, paramilitaries and police surrounded and, after a six-hour battle, took over the center of Masaya, Nicaragua's third-biggest city that had become a stronghold of anti-Ortega demonstrations. The goal appeared to be to impose Ortega's authority ahead of Thursday, when he addressed thousands of supporters in Managua on the 39th anniversary of the victory of the Sandinista revolution he led. That 1979 victory saw Ortega become the country's leader for 11 years before losing a 1990 election. After being re-elected president in 2007 he set about getting rid of political opponents by stacking the courts and electoral bodies in his favor. 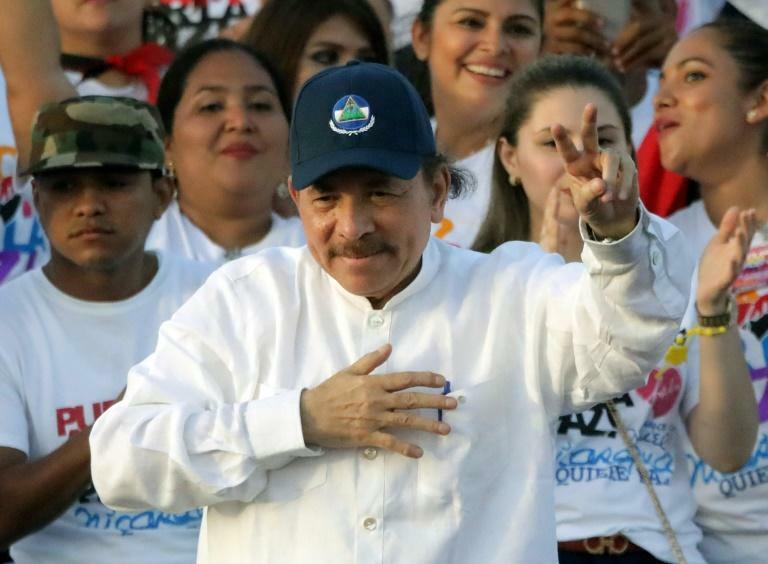 Although resented for his strongman tactics, Ortega won plaudits by keeping violence in his country well below that of most other Latin American nations, and maintaining a pact with the business sector to ensure economic stability. That veneer blew apart in April when ill-judged cutbacks to the cash-strapped social security system quickly grew into popular unrest at the ironfisted rule of Ortega and his wife -- and vice president -- Rosario Murillo. Since then, the body count has climbed and business chiefs have abandoned Ortega to side with the protesters, unions, rural groups and the clergy against his recourse to violence. Ortega's frustration with the bishops was in evidence Thursday when he said: "I thought they were mediators, but no, they are in bed with the coup-plotters." Nicaraguan Cardinal Leopoldo Brenes told the Canal 100% Noticias TV station that he was "meditating" on Ortega's accusation. He added that "we are keen to continue the dialogue, but we will discuss it." Without mediated dialogue it was difficult to see how a path could be found out of Nicaragua's crisis. One of Ortega's main objections is the demand that elections scheduled for 2021 be brought forward to March next year. The Organization of American States has condemned the repression in Nicaragua and backed the early-election call. "The United States is going to do everything possible so that Nicaragua returns to democracy," the US ambassador to the Washington-based OAS, Carlos Trujillo, told AFP. Trujillo said "all options were on the table," but when asked if that meant possible US military intervention, said: "Right now, no." New US sanctions on Nicaragua were being evaluated, he added. Ortega's government "needs to return to dialogue," Trujillo said. "When his government accuses the mediators of being terrorists, that makes it difficult to return to talks." Although Ortega has been careful to keep trade intact with the United States, he regularly used the same hard-left rhetoric shared with Venezuela's President Nicolas Maduro to accuse America of "imperialist" meddling in his country. On Thursday, he accused the US of financing the "coup" against him, and stated: "Our decisions don't come from Washington."